A capacitive sensor is a proximity sensor that detects nearby objects by their effect on the electrical field created by the sensor. Capacitive proximity sensors use an alternating voltage which causes the charges to continually reverse their positions. The moving of the charges creates an alternating electric current which is detected by the sensor. The amount of current flow is determined by the capacitance, and the capacitance is determined by the area and proximity of the conductive objects. Larger and closer objects cause greater current than smaller and more distant objects. The capacitance is also affected by the type of nonconductive material in the gap between the objects. The design of a simple capacitance meter is often based on a relaxation oscillator. The capacitance to be sensed forms a portion of the oscillator's RC circuit or LC circuit. A capacitive cable sensor functions by charging the unknown capacitance with a known current. The capacitance can be calculated by measuring the charging time required to reach the threshold voltage (of the relaxation oscillator), or equivalently, by measuring the oscillator's frequency. Material properties - most famous is probably the Stud Sensor patented in the seventies, that allows you to sense studs, water and mains lines in walls. In addition, capacitive sensors for touchscreens are more responsive than resistive touchscreens (which react to any object since no capacitance is needed), but less accurate. However, projective capacitance improves a touchscreen's accuracy as it forms a triangulated grid around the point of touch. As a distributor of Balluff, Yamatake, and Pepperl Fuchs capacitor cable sensors, we offer thousands of capacitive sensor solutions for you to choose from. Balluff and Pepperl Fuchs proximity sensors range from basic cylindrical plastic to stainless steel weld resistant models. These heavy-duty sensors can withstand the most demanding applications. Click the page links below for more information regarding the proximity switch manufacturers that we distribute. 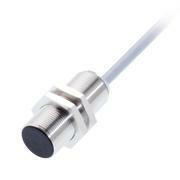 Control Components offers the full line of Balluff, Pepperl+Fuchs, and Azbil Proximity Sensors. Contact us for more information regarding our capacitor sensors and sensor components today, or request a quote for an in-depth price analysis.